Much of the world runs on coffee. If this crucial beverage starts your day, invest in the right coffee pot! How about a French press? With fresh coarse ground coffee and just four minutes, you can brew a hot, fragrant cup of energizing delight. 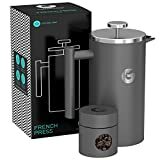 In this coffee guide you will discover what makes the best French press for coffee and tea through our French press reviews and comparisons. French press coffee brews most effectively fresh ground, coarse coffee. You'll want a burr grinder for best results as blade grinders produce a lot of dust that can make your coffee oily or gritty. Regardless of your roast preference, fresh ground coffee offers the finest flavor and aroma. It takes a little manipulation to make French press coffee, which increases your exposure to the delicious aroma of coffee and improves your enjoyment of the coffee making process. 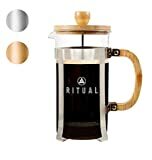 Fans of ritual will love the process of making French press coffee. You'll need your beans and grinder or coarse ground coffee, a French press pot, a hot water pot and a stirring utensil. This French press coffee pot offers traditional construction and preserves the fun of really fresh coffee; that is, watching it foam up. The only plastic on this coffee maker is in the heat resistant handle and the top of the plunger handle. No plastic touches your coffee directly. Plunger Characteristics: Metal domed lid with round plunger handle may cause some heat transfer; plunge with care. Cleanup: The pot is held in a metal bracket with plastic handle; all parts are dishwasher safe. This large French press brews several cups and keeps them hot while you begin your day! 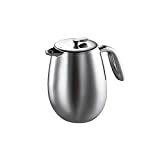 The metal pot makes it easy to clean; you can wash out and wipe down this stainless steel French press for a spot free finish. Carafe: Stainless steel, double walled for insulation. Cleanup: Promoted as dishwasher safe, but some users have found water within the double thermal walls. Wash by hand. This beautiful French press is complete free of plastic and offers a dual precision filter. It's not recommended that this tool go in the dishwasher; however, if plastics are a concern for you, this pot is an excellent choice. Glass, stainless steel and bamboo are the only materials used in the making of this beautiful pot and French press plunger. This pot is one of the more traditional French press sizes and produces three cups each of four ounces (the traditional French press cup), or two mugs. This simple French press offers a uniquely designed handle that wraps around the pot to protect it from damage. 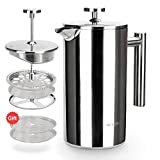 This double wall French press is a great spot to brew and store your French press coffee. It's made of premium stainless steel, so if breaking glass carafes is a frustration, this tool will be a great fit! This elegant French press features two layers of fine filtration for a crumb-free cup of coffee. 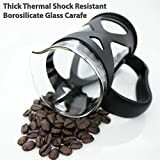 The glass carafe rests in a stainless steel sleeve with a large handle that offers plenty of clearance, so no knuckle burns before you've had a cup. This striking insulated French press offers three layers of filtration and up to two extra mesh screens to give you nothing but delicious coffee in your cup. Only dedicated fans of French press coffee need consider this formidable Bodum coffee pot. 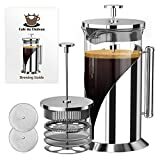 In addition to 51 ounces of brewing capacity, this carafe has double walls for thermal insulation and stainless steel finish; no plastic to worry about. 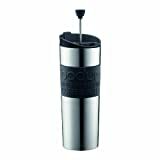 The Bodum stainless French press travel mug is an ideal option for busy folks on the go. Your French press filter has several components and filtering steps. There are multiple plates within the filter; some for moving large amounts of water easily and some for capturing fine bits of coffee grounds. Coffee gets much of its flavor and aroma from the oil in the beans. This oil can stain the glass of your French press carafe and clog your filters. Your plunger covers the top of the French press pot. The filters for your French press pot live on the business end of the plunger, while the handle of the plunger lives on top. This mechanism is fairly straightforward; the only way to damage your French press plunger is to let it get dirty so it gums up and has to be forced, or to bend the plunger rod. Most French press pots are clear glass, while most portable French press cups are stainless steel. There are many French press pots on the market that offer double wall construction to keep your coffee hot, but this also stores it on top of the grounds. Depending on how quickly you consume your coffee, this may not be a problem. Several of the French press pots in this review brew 34 ounces of French press coffee, while some brew less and one brews only a travel cup. For best results, if you're going to brew several cups, move the coffee to a thermos or carafe to maintain flavor. Cleaning your French press will be easy, but you need to do it soon after brewing. Authorities with FrenchPressCoffee.com recommend dumping the grounds into a strainer (rather than the drain) for a clean transfer to trash or compost bucket. Add warm water and a bit of soap to your French press, run the plunger up and down inside the carafe to clear the fine filters, and rinse thoroughly. Wipe out the inside of your French press to remove coffee oils, let the plunger air dry and you're ready for the next pot! French press pots are an ideal addition to your coffee arsenal as you can brew robust, delicious coffee with only hot water and a little time. Are they more involved than a drip coffeemaker? Yes. But you can start your day with focus, intention, and the aroma of amazing coffee. These pots come in a variety of shapes and sizes, from a large carafe to a single traveling cup. No matter how much French press coffee you need, be certain to keep a separate carafe or thermos available so you can transfer your coffee away from the grounds. 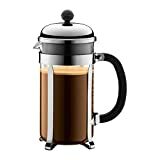 French press coffee offers coffee fans a chance to enjoy true coffee flavor with no paper filter interference. There is a risk of coffee grounds entering your cup, but re-straining is always an option; you can even do it as you transfer your coffee to a thermos. If we had to choose just one French press, we would consider the Bodum CHAMBORD as one of our top picks. It has a classic look and can make enough coffee for that early morning rush to work! If you prefer to grab a fresh cup at work or on the go, consider the Bodum Travel French Press. Did you enjoy this buying guide? 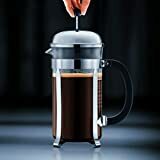 Let us know in the comments with your favorite French Press brand or style and any questions you might have before purchasing a new coffee press.